An indoor hobby, like stamp collecting, and an outdoor one, such as trout angling, keep Ellis Parker Butler, the author and humorist, well supplied with leisure interests quite aside from his active work in the Authors' League, of which he is president, and in the Dutch Treat Club, of which he is the founder. Formerly president of the Flushing (L. I.) Savings and Loan Association, he now devotes his entire working time to writing, and occasionally builds a magazine article, story, or even a complete volume around one of his hobbies. His Young Stamp Collector's Complete Guide, published in 1933, is the thirty-second volume he has published, but none is so famous as his early story, Pigs Is Pigs. His own stamp collections are well known, and his Luxemburg collection, which fills five volumes, is one of the best in America. 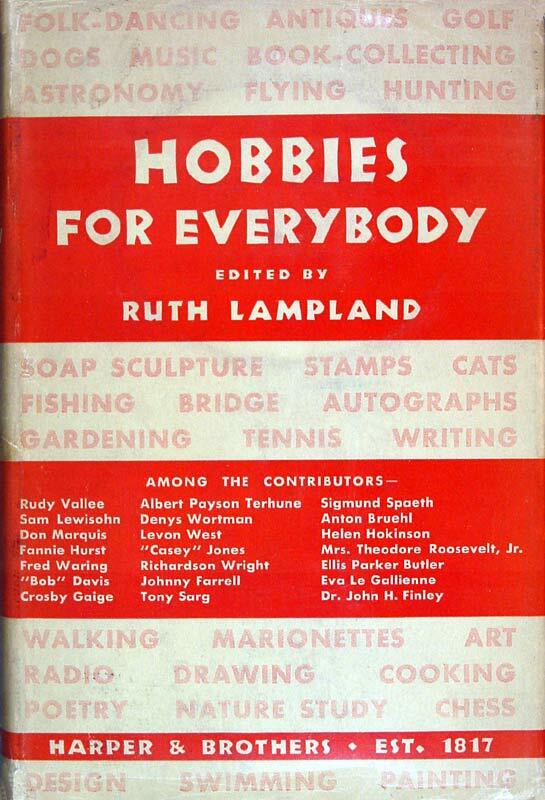 I never did like the word "hobby" and I don't like it now; it suggests some old red-faced colonel, retired after years in India, boring everyone with endless talk about medals or old pistols until they wish he was dead and buried. My stamp collecting is not a "hobby" -- it is my spare-time amusement, and I don't care if no one ever sees my stamps. I don't "ride" it or ride anyone with talk about it. I collect stamps for the fun I get out of it. By the time this is printed I will be 65 years old. I began collecting stamps 51 years ago, and I enjoy stamps more now than I ever did. I know more about them. I appreciate them more. 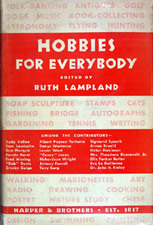 When I was a small boy I collected coins, bird eggs, sea moss, shells and all the quaint and curious things all boys collect, and my first stamps came to me through trading something or other with some boy who had stamps to trade and who advertised the fact in the exchange page of Harper's Young People. I probably traded some duplicate coins for his duplicate stamps. From then on I was a stamp collector. Today one of the favorite fields for stamp collectors is that of United States stamps. They are beautiful, some are excessively rare, and the minor varieties are numerous enough to delight the most eager specialist. There is more printed about them in this country than about all the other stamps together, so that knowledge concerning them is most easily found. But the boys of 1883 did not care a hoot for United States stamps. We could look out of the window and see the United States. What we collected -- because they were strange and exotic and had an aura of romance -- were "foreign" postage stamps. Almost all the collectors of that day were "foreign postage stamp collectors" and foreign stamps are still the first to arouse the young collector's enthusiasm. The foreign stamp is Romance and hunting for the stamps needed to complete a set or an album page is Adventure. Aside from the delight of collecting -- which any branch of collecting offers -- the stamp has the advantage of being the smallest and most compact object for the collector's attention. Hundreds can be carried in a vest pocket; thousands can be kept in a small album. They do not tarnish or rust or need dusting. A collection may be worth a million dollars but quite as much pleasure may be had with only a few cents to spend. There need be no hit-or-miss guessing at what a stamp is worth because there is a priced catalogue of every stamp ever issued. There are several ways for the person who knows nothing about stamps to begin collecting. I know one man who stopped one day in front of a showcase of stamps displaying small "sets" and who was attracted by a set of Egyptians priced 18 cents or so. He went in and bought that set, and he bought two or three other sets, and that set him going. Today he has one of the most complete collections of United States stamps and he won't stop until it is complete or the sexton puts him underground. But I believe one of the best methods is to begin by buying one of the "all different" packets. Not, please note, a "mixture" packet that has a lot of duplicates. They are, in my opinion, a nuisance. You can buy 150 stamps, all different, for 10 cents. You can buy 1,000 all different for $1, and so on up to 20,000 all different stamps for $350. For a boy or an adult who wants to see if he would like stamp collecting I suggest a 1,000 "all different" packet and a cheap stamp album, perhaps one that costs 50 cents to $1.50. These have spaces for from 3,700 to 12,000 stamps, with many illustrations to show where to put them. The collector will enjoy sorting these stamps and finding their places in the album, and while doing so he will learn a lot about stamps. Unless I am mistaken he will want to continue. Stamps are not pasted flat in the album these days. The collector buys an envelope of "hinges" -- thin gummed papers -- for 10 cents a thousand or more. The "hinge" is bent double with the gum side out, one half lightly attached to the back of the stamp and the other half to the album space. Thus a stamp can be removed without damage. The collector will soon want a larger album and will transfer his stamps to it. Another way to begin -- and I would use it if I were beginning today -- is to decide to collect some one sort of stamps, or of some one country. This is because there are so many stamps now that a complete "general" collection of all the world's stamps is an impossibility. If you can decide on one sort of stamp you will probably increase your pleasure. Air-mail stamps alone will keep you busy for a lifetime. United States stamps are perhaps best for a man who is past the age to be thrilled by a stamp because it is foreign. I collect Luxemburg now, and nothing else, and if I live to be as old as Methuselah I'll not have my collection complete, but in my day I have made collections of United States revenue stamps, of the "Black Jack" Jackson heads, and of France and her colonies. Very soon after beginning to collect stamps a man will want a catalogue. The only one for the general collector is the Standard which costs $2.50, with illustrations and prices of every stamp. There are also special United States catalogues, air-mail catalogues, etc. The catalogue is a mine of information. If you do decide to "specialize" to the extent of collecting one sort of stamp only you can buy a packet of all-different stamps of your favored variety. This is excellent as a starter. You can get 25 different air-mails for 15 cents, or 100 For $3 or less; 100 different stamps from South America cost only 60 cents. Or, if you choose a single country, as I did, you can get a packet of all different stamps from that country as a starter. You can get 50 Luxemburg, all different, for 50 cents. The "specialist" usually prefers a blank-leaf album, and these may be had at all prices. Get one with removable pages. There are now some excellent albums for United States, airmail and other special sorts, with illustrations and spaces for all stamps. If you begin with an "all different" packet you can follow it with the purchase of "sets" of stamps of your particular field, filling many spaces thus. Then you continue the search for stamps to complete an album page and buy single stamps as you can spare the money or find the stamps. Dealers -- and there are now hundreds of them -- like to receive "want lists" naming the stamps you need to fill spaces and will send them on approval. Most dealers also send "approval sheets" or "approval books," either of general stamps or of the special kind you are collecting, from which you can make selections, returning what you do not want. As your collection begins to be somewhat complete you will discover that some stamps you need -- even some quite cheap ones -- are not easy to find. Few dealers pretend to keep all the stamps on hand -- it is almost impossible to do so; and so begins what I find to be the best fun of collecting -- the hunt for stamps to fill a page of my album. It may take me years to find a No. 7 Luxemburg canceled at Echternach, but I never let up till I have it. The tools of the stamp collector are not many. It is good to have a small magnifying glass -- 10 cents to $2 -- and a pair of stamp tongs to pick up stamps when the fingers might soil them can be had for 25 cents or less. A benzine cup in which stamps are laid and wet with benzine in order to see the watermarks may be needed as you progress, and a perforation gauge identifies stamps when necessary. The "cup" should not be more than 50 cents, and the gauge is one dime. All these things may be had of any dealer. The rest of the pleasant spare-time amusement of stamp collecting is fully set forth in several of the books that have been written on the subject, and it is probably just as well to have one of them. Like all books on collecting the authors have gathered much interesting matter between the covers. By the time you have learned something more about perforations watermarks, roulettes, wove and pelure paper, overprints and the many other varieties and variations that form the stamp enthusiast's vocabulary you will be a stamp collector for life and welcomed by the million or more fellow stamp collectors of America. BUTLER, ELLIS PARKER, The Young Stamp Collector's Own Book. New York; Bobbs-Merrill, 1933. KIMBLE, RALPH A., Commemorative Postage Stamps of the United States. New York: Grosset and Dunlap, 1933. __________, How to Collect Stamps. New York: Grosset and Dunlap, 1932. KING, BEVERLY, AND JOHL, MAX G., United States Postage Stamps of the Twentieth Century (vol. I: 1901-1922, vol. II: 1922-1933). New York: H. L. Lindquist Pub. Co., 1933 and 1934. PHILLIPS, STANLEY, AND RANG, C. P., How to Arrange and Write up a Stamp Collection. London: Gibbons, 1933. STILES, KENT B., Stamps, New York: Harpers, 1929. THORP, PRESCOTT, How to Build a Stamp Collection. New York: John Day Co., 1932. Stamps (weekly -- Saturdays). Stamps Publishing Co., 100 Sixth Ave., New York.